With its 'fun in the sun' attitude, Miami Beach in Florida offers up a veritable feast for the senses with garden-to-glass cocktails, white sand beaches, crystal clear waters, top notch eats, Art Deco buildings or street art on almost every corner, all with a Latin flare. 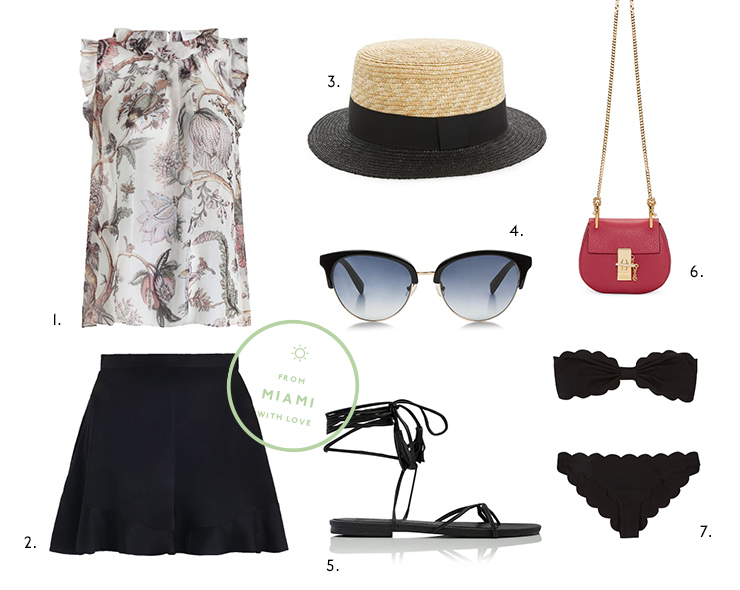 Here's our list of absolute must-do’s when soaking up the sunshine for 48 hours in Miami. 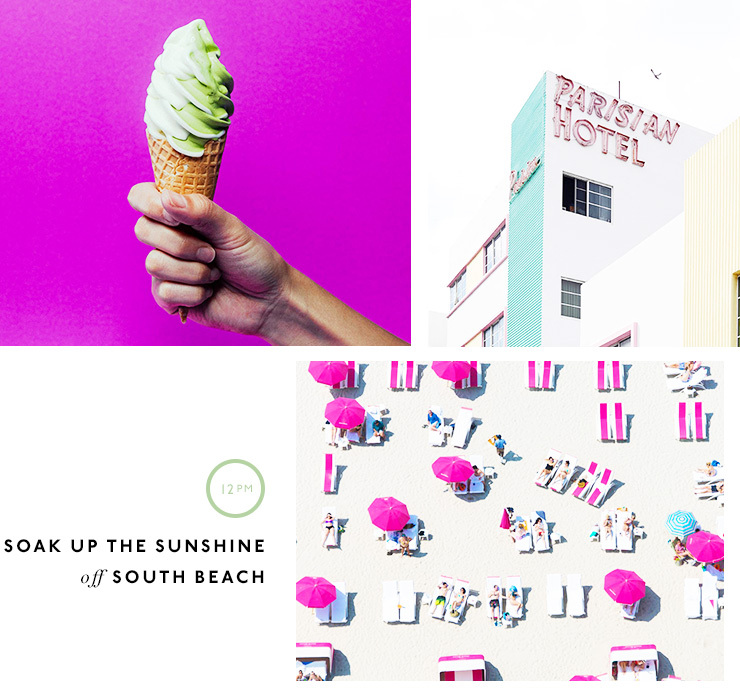 Check into the Fontainebleau Miami Beach, an iconic luxury hotel dating back to the mid 1950s. Following a $1 billion upgrade in 2008, this iconic hotel now boasts two new towers and 12 of Miami's hottest bars and restaurants, including LIV. There's also a 3,700 m2 spa with mineral-rich water therapies, and a bow-tie shaped ocean-front pool. Make sure you snap a pic on the floating staircase to nowhere. Head down to South Pointe to have dinner at Joe's Stone Crabs. 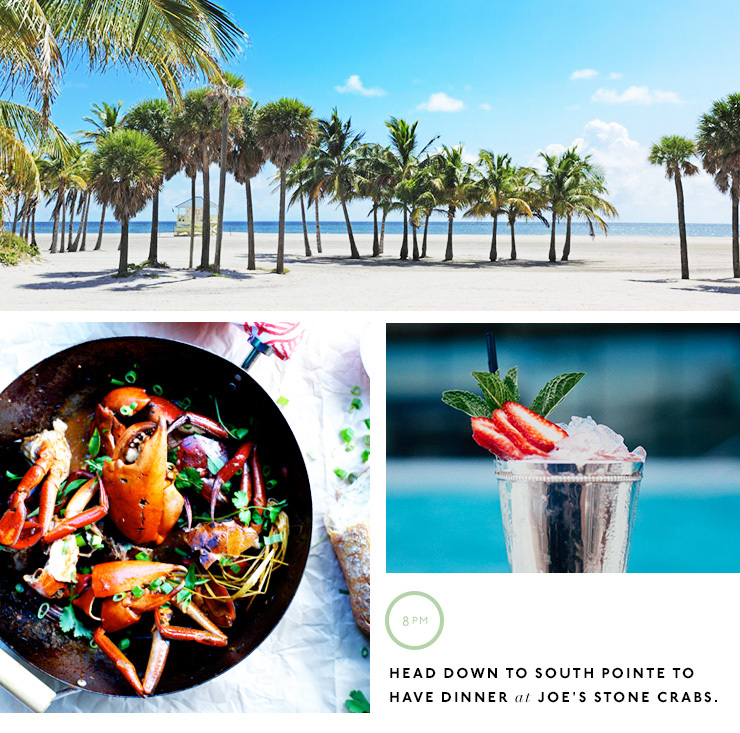 Founded in 1913, Joe's has been part of the Miami Beach scene since before the area was formally incorporated and it's been a favourite of royalty, gangsters and even former head of the FBI, J.Edgar Hoover. For the full Joe's experience, have drinks at the bar (the spot to see and be seen) then order 'Joe's Classic', a full serving of crab claws with their signature mustard sauce, hash brown, creamed spinach, coleslaw and a slice of their famous key lime pie. Relax and watch day turn into night as you take in the panoramic view overlooking the downtown Miami skyline and surrounding waterways from Sugar, a rooftop bar on the 40th floor of East, a new hotel in Brickell. Head down to Ocean Avenue for a spot of people watching, street art spotting and Art Deco admiration. When it comes to Miami, most people photograph two things; the beach and the Art Deco buildings. In the “Art Deco Historic District” alone, there are more than 800 perfectly preserved—and often pastel—examples of the style that has become part of South Beach’s iconic style. There's plenty of walking tours to choose from, with our without cocktails, but the best is the Miami Design Preservation League daily walking tour (twice on Thursdays) which starts at the Art Deco Welcome Center on Ocean Drive. With the temperature rising, cool down with a frozen pina colada at the Clevelander on Ocean and 10th before heading across the road to soak up the sunshine and swim in the turquoise water off South Beach. Hire sun lounges and an umbrella from Boucher Brothers (but be prepared to pay $$$ for the pleasure) or wander along the shoreline to admire the lifeguard huts, each one unique in style and colour. Fashionistas and shopaholics will want to visit Lincoln Road Mall, a mile long, pedestrian-only promenade which is home to brands including high end label stockist Alchemist as well as Debbie Katz, Anthropolgie, J.Crew, and vintage shop, Fly Boutique. While you're there, stop at Freddo, a wildly popular organic Argentinean Ice Cream chain where the tradition of gelato-meets-helado is making major waves! Sample a grilled ice cream sandwich or try a few of the flavours that have made South Americans smile since 1969. When it comes to cool bars, Living Room, the indoor/outdoor lounge at W South Beach, is the place to go. Locally sourced ingredients are part of the bar’s dedication to sustainable practices. If you'd prefer a cold beer, Miami Beach’s only brew pub—The Abbey Brewing Company, just off of Lincoln Road—serves its own award-winning menu of ales plus a dozen other international beers as well as a full bar. Dance the rest of the night away at LIV at Fontainebleau. Put your finger on the pulse of Little Havana as you mingle with Cuban locals and get your caffeine fix at “La Ventanita” (coffee window) at Versailles Restaurant. With the restaurant dating back to 1971, don't be surprised if you find national TV news crews or Presidential candidates chatting with locals over a Cuban espresso. If you're feeling peckish, grab a guava and cheese pastry to go with your coffee. Calle Ocho, or Eighth Street, is the unofficial capital of Miami's Cuban community. With its Cuban coffee windows (or ventanitas), cigar shops, music and cultural activities, Calle Ocho is the main artery of Little Havana. Maximo Gomez Domino Park is a landmark on Calle Ocho, and is always full of neighborhood domino players, usually older men who have mastered the game over years of practice. Named after the famous soldier Maximo Gomez who fought for Cuban independence from Spain, Domino Park sits on the corner of Calle Ocho and 15th Avenue. Uber across to Bayside and jump on the catamaran Caribbean Spirit for an afternoon of swimming and snorkeling off South Beach. If the weather is right, the captain will drop anchor at Jose Cuervo Reef where tequila brand Jose Cuervo dropped airline bar back in 2000 to celebrate Cinco de Mayo (or in this case, Sinko de Mayo). Don't forget your GoPro to catch as the bar is now home to plenty of colorful tropical fish as well as lots of corals and sea fans. 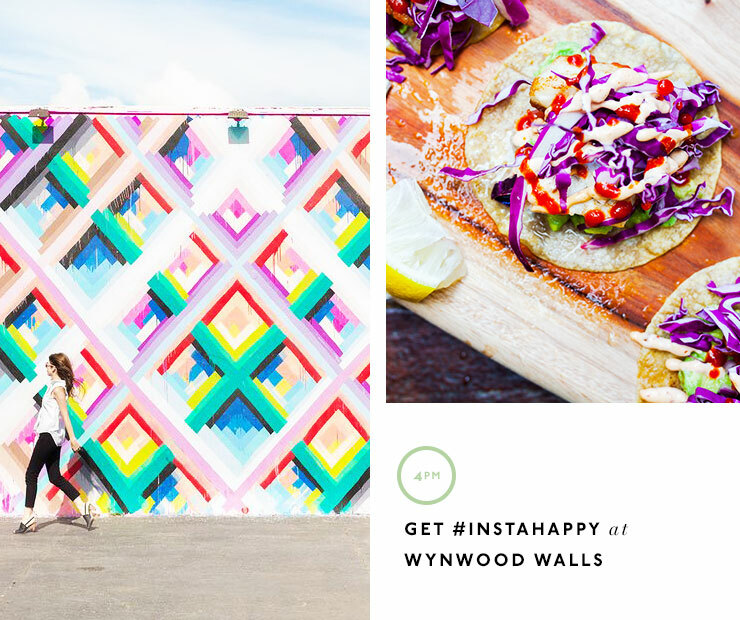 Get #instahappy at Wynwood Walls. 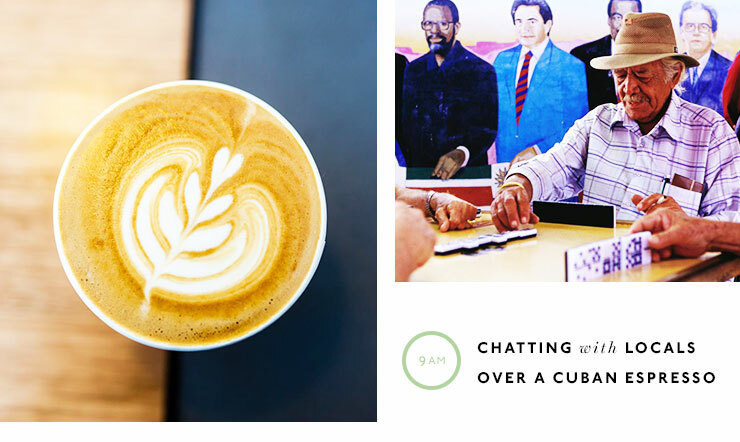 Conceived by the late Tony Goldman, the man responsible for revitalizing NYC's Soho precinct, Wynwood Walls is a must visit for budding fashion bloggers, art aficiados or anyone with an appreciation for cool street art. Sit back and watch the 'likes' clock up over these #instaworthy artworks. Stop for a spot of shopping at Marine Layer (217 NW 25th St), Frangipani and Le Labo Inc Fine Perfumerie. While you're on 2nd Ave, grab a juice from Jucy Lu and cool off in the courtyard out the back. Refuel with tacos and hand-smashed guacamole at Coyo Taco, a Wynwood taqueria at 23 and 2nd Ave. Once you've got your order, make your way through the 'secret' unmarked door at the back of the restaurant and you'll find yourself in a outdoor bar with DJs spinning until late and an impressive number of tequilas and mezcals, craft beers and 'paletaritas': delicious popsicle-based margarita cocktails. Looking for more holiday inspo? Check out 48 Hours In Koh Samui!